I seem to be having great luck recently, on each trip not only have we been finding new species but also finding things out of place. This was the case during a dive on Bag island in the Raja Ampat recently. The currents were roaring and the swell was unpleasantly large at the planned dive site. Knowing my group very well from plenty of previous adventure dive trips I knew they would have keel-hauled me for putting them into such strong currents. I opted for a nice easy dive on a reef slope I had previously checked out on Southern Bag Island rather than one of the smaller islands. The reef itself looked fair for critter hunting; there were some great patches of hard coral in the shallows going down to scattered bommies with a variety of invertebrate growth with some great lettuce coral formations and lots of sandy patches in between. The reef turned out to be pretty good too. As we dived further along the reef we happened upon a few awesome features such as reef spurs that jutted out from the main reef slope with mini walls and deep overhangs filled with colorful soft corals. We were going really slowly as critter life was giving us enough to keep a slow pace and the fish life wasn’t bad either, we saw a black tip shark cruise by fairly close too. We were almost an hour into the dive at less than 10 meters when I noticed a very interesting looking black eel below me. Well, that is what it looked like at a very quick glance. All of a sudden I became aware of what it really was. This was no eel, this was a really elusive fish, a fish that divers can search for for years and never spot. 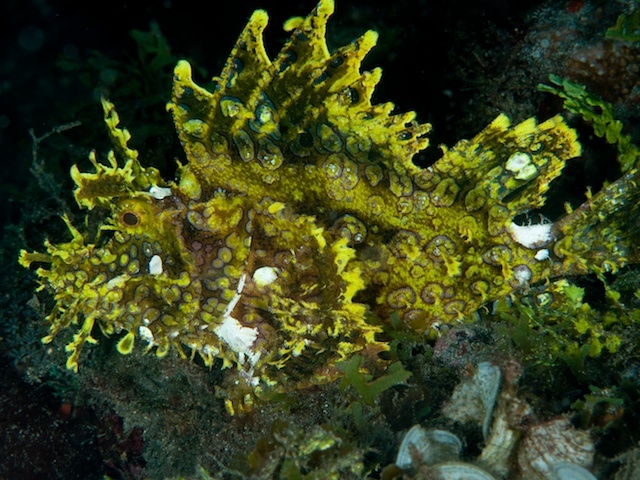 Scientists, biologists, marine life enthusiasts and dive guides all over the Asia-Pacific have sought out these really mysterious fish. I know about major dive expeditions that have gone in search of this very fish and still only had the odd lucky glimpse of its head. There have been TV documentaries and National Geographic stories written about these fish and yet they are still an enigma and very little known is about them. I’ve personally only seen the head of this fish a couple of times, popping out its hole. The fish that we had the privilege to encounter was an adult Convict Fish, Pholidichthys leucotaenia, one of the most mysterious fish on the planet. Whilst this fish is one of the most elusive and mysterious species know to marine biologists, it would be wrong to call it ‘rare’. It’s common to see the juveniles on reefs and at times we can see literally thousands of them, large social schools resembling juvenile catfish, swarming over the substrate like an army of aquatic ants. But then, as they reach maturity, they just disappear…thousands of juveniles and no adults! A mystery indeed! Its only in the last few years that a few pieces of the jigsaw that make up the life of the Convict Fish have been pieced together. The adult constructs a series of burrows covering as much as six meters, which it rarely (if ever) leaves. Most divers consider themselves lucky to see the head of an adult as it pokes out of its hole, spitting sand and debris from its burrow. How they mate and what they eat are still missing pieces of the puzzle, though an interesting theory has been proposed to explain how the fish can grow to two-feet long seemingly without feeding. During the day the juveniles swim free across the reef but at night they return to the burrow, a unique trait for a fish. A study on Convict Fish observed adults holding juveniles in their mouths and the current theory is that the young bring food back for their parents, but at the moment this remains a unproven theory. If the theory proves correct it will be another trait unique to this amazing species. It’s not even clear which taxanomic group the fish belongs to, though often refered to as the Convict Blennie it’s certainly not a blennie and DNA testing has so far proved inconclusive. Adult Convict Fish are rarely seen, never mind photographed, so it was with trembling fingers that I lined up my camera. Not being the best shooter in the world it took me a few shots to get my settings and exposures close enough, but I knew I had to get a few full body shots and a close up of this weird face. Luck was on my side as the fish was not shy and didn’t spook as I got closer. We even managed to witness some very interesting behaviour too. It was assumed that living in burrows would result in this species having poor eyesight but this didn’t prove to be the case. While observing it’s movements it became apparent that the fish has an amazing sense of what is in front of it, it never banged into anything, as it neared the reef it would come to a quick stop, pause then change direction. A few times when diver and camera was placed in front of it we even watched as it swam perfectly backwards slithering its long slender body in reverse. What a great pleasure it was to witness this first hand; if only we had someone shooting film with a decent high-definition camera, this was perfectNational Geographic material here!